To Cite: Rahimi F. Molecular Characteristics of Biofilm-Producing Methicillin-Resistant Staphylococcus epidermidis Isolates Causing Urinary Tract Infections, Arch Clin Infect Dis. 2018 ; 13(6):e61704. doi: 10.5812/archcid.61704. Background: Coagulase-negative Staphylococcus epidermidis is the most prevalent member of the human skin normal biota that plays an important role as a common cause of catheter and prosthetic device-related infections from, for example, indwelling catheters. Objectives: This study aimed to characterize the clonality of biofilm-producing methicillin-resistant S. epidermidis (MRSE) strains isolated from catheterized patients with urinary tract infection at a referral hospital in Tehran, Iran. Methods: Between 2014 and 2016, a total of 56 methicillin-resistant S. epidermidis (MRSE) strains were recovered from catheterized patients. The MRSE isolates were tested for biofilm formation and different genes involved in this process were detected. Clonal dissemination of MRSE isolates was determined using the combination of pulsed-field gel electrophoresis (PFGE) and SCCmec typing. Results: Out of the 56 MRSE strains, 50 (89%) formed biofilm and were positive for icaA and icaD genes, and 73% (n = 41) harbored IS256. The PFGE patterns revealed a total of 32 different pulsotypes consisting of 16 single types (STs), 16 common types (CTs), and 2 SCCmec types (III and IV) were detected. Moreover, all STs carried SCCmec type IV and classified as community-acquired strains. Four CTs were common among biofilm and non-biofilm producing strains. Conclusions: The presence of icaA and icaD genes with a high prevalence of IS256 element in clonal groups of MRSE strains suggests that ica, IS256, and biofilm forming ability occur simultaneously in specific S. epidermidis clones and spread preferentially in hospitals and community. Staphylococcus epidermidis as a most important member of coagulase-negative staphylococci (CNS) is known as a part of the human normal microbiota (1, 2). S. epidermidis is now recognized as an opportunistic pathogen, and is the most important cause of indwelling device-related infections from central venous catheters, prosthetic joints, artificial lenses, CSF-shunts cardiac pacemakers, heart valves, and so on (3). Staphylococci, mostly S. epidermidis and Staphylococcus aureus, are the most important causative agents of device-associated infections that do not respond properly to antimicrobial treatments (4). The adherent biofilm-associated staphylococci developed on the surface of indwelling devices show a significantly greater resistance to antibiotics compared to their planktonic counterparts (5, 6). In the biofilm form, bacteria are embedded in a sticky extracellular matrix that protects them from the mechanisms of host defense (2, 6). Bacterial biofilm formation in catheterized patients is a four-step process consisting of adherence, accumulation, maturation, and dispersal (5, 6). Binding of staphylococci to extracellular matrix proteins is due to microbial surface components recognized as adhesive matrix molecules (MSCRAMMS) (2, 3). The ica gene cluster in S. epidermidis appears to have an important role in the pathogenesis of device-related infections (3), and biofilm in S. epidermidis is due to the icaADBC operon that is responsible for the synthesis of a major component of exopolysaccharide matrix, polysaccharide intercellular adhesion (PIA) or polymeric N-acetyl-glucosamine (PNAG) (2, 5, 6). It has been indicated that IS256 as an insertion sequence element can influence the expression of ica operon, biofilm formation, and resistance to aminoglycosides (7). Compared to active cells, biofilms that are dormant cells show reduced activity in different processes such as DNA replication, protein synthesis, and cell division, which decrease the efficacy of different antibiotics that target these bacterial processes (2). This study aimed to characterize the clonality of biofilm producing methicillin-resistant S. epidermidis (MRSE) strains isolated from catheterized patients with urinary tract infection during a 2-year period at a referral hospital in Tehran, Iran. A total of 351 strains of S. epidermidis were isolated from 413 urine samples of catheterized patients (long-dwelling catheters) who showed clinical manifestations such as fever (> 38.0°C), suprapubic tenderness, pain, urinary urgency, urinary frequency, and dysuria at a referral hospital in Tehran between June 2014 and May 2016. Urine specimens were obtained from adult patients via the clean-catch midstream technique, according to the guidelines by Wilson et al. (8). The urine samples were cultured on blood agar plates (Merck KGaA, Darmstadt, Germany) and colonies suspected to be staphylococci were subjected to polymerase chain reaction (PCR) using species-specific gseA gene primers, encoding for glutamic acid specific protease (9) (see below). The S. epidermidis (ATCC 35984) and S. aureus (ATCC 29213) isolates were used as positive and negative references, respectively. The S. epidermidis isolates were stored in glycerol-nutrient broth at -80°C. The susceptibility of S. epidermidis isolates to cefoxitin (30 µg) was tested using a disc diffusion method on Muller-Hinton agar (Merck KGaA, Darmstadt, Germany) according to the Clinical Laboratory Standards Institute (CLSI) guidelines (10). To achieve the slime producing MRSE strains, the bacteria were cultured on Congo red agar plates prepared with brain heart infusion agar (Oxoid, LTD., Basingstoke, Hampshire, England) supplemented with 36 g/L sucrose and 0.8 g/L Congo red dye (Merck KGaA, Darmstadt, Germany) and were analyzed as described previously (11). All bacteria were tested for slime black colonies and were regarded as slime producing isolates. S. epidermidis ATCC 35984 and S. epidermidis ATCC 12228 served as positive and negative references, respectively. A crystal violet assay was performed to measure the ability of the bacteria to adhere and form biofilms in trypticase soy broth (TSB) medium (Merck KGaA, Darmstadt, Germany) supplemented with sucrose, as described previously (12). The cutoff OD value (ODc) was defined as three standard deviations above the mean OD of the negative control. The biofilm formation was classified as strong (4 × ODc < OD570), moderate (2 × ODc < OD570 ≤ 4 × ODc), weak (ODc < OD570 ≤ 2 × ODc), and negative (OD570 ≤ ODc) (13). DNA of all bacterial isolates was extracted using QIAamp DNA Mini Kit (Qiagen, Hilden, Germany) according to the manufacturer’s guidelines. PCR primers specific for gseA and mecA genes and conditions of PCR were as described previously by Ikeda et al. (9) and McClure et al. (14), respectively. The aap, icaA, icaD, IS256, and ica operon genes were detected using specific primers introduced earlier by Petrelli et al. (15) and Conlon et al. (16). S. epidermidis ATCC 35984 was employed as a positive control. A multiplex PCR assay using specific primers for SCCmec types I-V was employed for typing of MRSE strains. PCR cycles and conditions were identical to those described by Miragaia et al. (17). PFGE was used to type all biofilm producing MRSE isolates in CHEF-DR III system (Bio-Rad, Hercules, CA, USA) using chromosomal DNA digested with SmaI (Roche, Mannheim, Germany) according to the conditions described previously for S. aureus by Chung et al. (18). Salmonella choleraesuis serotype Branderup H9812 digested with XbaI enzyme (Roche, Mannheim, Germany) was included as a molecular size marker. The banding patterns of MRSE strains were analyzed by the UPGMA method using Gelcompare II software version 4.0 (Applied Maths, Sint-Martens-Latem, Belgium) according to the guidelines described by Tenover et al. (19). All 351 S. epidermidis strains isolated from catheterized patients were confirmed by PCR using specific primers. Amongst them, 56 (16%) strains were resistant to cefoxitin and classified as MRSE. All MRSE strains isolated from outpatients and inpatients within 72 h after hospitalization were regarded as community-acquired MRSE (CA-MRSE). By qualitative Congo red agar assay, 50 (89%) MRSE strains were found to produce black colonies and slime layer while 6 (11%) isolates did not produce slime layer and identified as non-biofilm strains. Moreover, out of the 56 MRSE strains, 22 (39%), 18 (32%), and 10 (18%) isolates exhibited high (OD570 ≥ 0.5), moderate (0.2 ≤ OD570 < 0.5), and weak (OD570 < 0.2) level of biofilm formation. On the other hand, 6 (11%) strains were not able to form biofilm (OD570 ≤ ODc). Of the 56 MRSE strains isolated in this study, 45 (80%) biofilm producing isolates harbored aap gene. Moreover, icaA and icaD genes were amplified in 50 (89%) strains (Figure 1). IS256 was detected among 41 (73%) biofilm producing and non-biofilm producing MRSE strains. 17% of the non-biofilm producing strains harbored IS256 while this transposon was not present in 20% of the strains that were positive for icaA and icaD genes. In addition, ica operon was detected in 52 (93%) strains. The results of PFGE typing revealed the presence of 32 pulsotypes (PFGE types) consisting of 16 common types (CTs) and 16 single types (STs) (Figure 1). The diversity of non-biofilm producing MRSE strains was limited to 5 CTs and none of these isolates belonged to STs, whereas the biofilm producing strains belonged to 15 CTs and 16 STs (50 isolates). CT 1 was the dominant PFGE type, constituting of 5 (9%) isolates while 4 (7%) isolates were classified as CT 2. In this study, CTs 2 - 4 and CT 6 were common among biofilm and non-biofilm producing isolates and none of the biofilm producing strains were present in CT 9. IS256 was found among all strains in 6 CTs (3, 7, 10, 12-14) while none of the strains in CTs 5 and 9 harbored this transposon. All 56 cefoxitin resistant strains were mecA positive, and SCCmec types III and IV were detected in 40 (71%) and 16 (29%) MRSE isolates, respectively (Figure 1). All non-biofilm producing strains harbored SCCmec type III and the presence of SCCmec type IV was limited to STs. Using a high-quality PFGE typing method, we found the presence of certain clonal groups of MRSE in patients with UTI at a referral hospital in Tehran, Iran. The MRSE strains in this study had the lowest frequency among hospitalized patients in Iran (12, 20) that could be partly due to the fact that in this study, we focused on isolating MRSE strains from UTI patients with indwelling medical devices. The combination of two different quantitative and qualitative biofilm assays revealed that 89% of the MRSE strains were slime producers. Similar results have been reported in Germany (7, 21). On the other hand, in other studies, a lower rate of biofilm formation was reported (22, 23). In S. epidermidis and methicillin-sensitive S. aureus (MSSA), the ica locus is responsible for the production of PIA, which is necessary for cells-cell interaction (2, 3, 5, 6). We showed that all biofilm producing MRSE strains harbored icaA and icaD genes and they were able to form slime and black colonies. This finding is in contrast to those found by Arciola et al. (22) reporting that these genes were not detected in 100% of biofilm producing isolates while it is in agreement with other studies (24-27). The comparison of biofilm-forming and non-biofilm producing strains in this study may indicate the importance and necessity of ica locus genes for slime layer production and biofilm formation, which is consistent with other reports (3, 25, 26). In the present study, the rate of ica operon was higher than that reported in other reports. Petrelli et al. revealed, “Detection of icaADBC is not suitable as a discriminating test for the invasiveness capacity of S. epidermidis” (15). On the other hand, the lack of aap gene results in the decreased attachment of S. epidermidis strains to polystyrene and indwelling medical devices (6, 28). Different reports indicated the presence of transposon IS256 in S. epidermidis strains isolated from clinical samples (7, 29, 30), but Conlon et al. reported that the integration of this transposon to ica locus results in the inability to form biofilm among S. epidermidis strains (16), which is in contrast to these findings. This group also indicated the higher prevalence of IS256 in community-acquired strains compared to hospital-acquired strains. The correlation between ica operon, biofilm formation, and presence of IS256 in clinical strains of S. epidermidis was shown previously (7, 31, 32). These data suggest that ica, IS256, and biofilm forming ability occur simultaneously in specific clones and spread preferentially in hospitals and community (30). In the present study, SCCmec type III was the dominant type, which indicated the hospital origin of these strains. The remaining strains harbored SCCmec type IV and they were classified as community-acquired strains. In contrast, Li and colleagues found four different SCCmec types among MRSE strains isolated from a hospital in China (30), in which the SCCmec type III was the dominant type. These findings are in agreement with those found by Delgado et al. in Spain (25). This variation could be in part due to differences in the geographical regions, sites, and wards of sampling. The high-quality PFGE method revealed an extensive genetic diversity among these bacteria. The prevalence of clonal groups of S. epidermidis strains has been reported in many studies worldwide (17, 25, 33-36). The PFGE results showed that CT-1 was the most represented pulsotype, which comprised 9% of all isolates in this study. The presence of four common CTs among biofilm and non-biofilm producing MRSE strains further support the spread of these clonal types in Tehran’s hospitals. Moreover, 18 (32%) MRSE strains (CTs 1 - 5) were detected in more than one year, indicating their alarming residence in the hospital over time. In conclusion, these results illustrated the diversity of biofilm producing MRSE strains among catheterized patients in a referral hospital in Tehran, Iran. As there is no information for molecular characteristics of MRSE strains in Iran, we were unable to compare the results of hospital MRSE strains with each other, and additional studies are necessary. The authors would like to acknowledge Dr. Hassan Namdari from Clin-Micro Immunology Center, Clarks Summit, PA, the USA for his critical review and English language editing of the manuscript. Funding/Support: This research was funded, in part, by an operating grant of the Vice Chancellor for Research and Technology at the University of Isfahan (grant No. 920411). 1. Grice EA, Segre JA. The skin microbiome. Nat Rev Microbiol. 2011;9(4):244-53. doi: 10.1038/nrmicro2537. [PubMed: 21407241]. [PubMed Central: PMC3535073]. 2. Otto M, editor. Molecular basis of Staphylococcus epidermidis infections. Seminars in Immunopathology. Springer; 2012. p. 201-14. 3. O'Gara JP. ica and beyond: Biofilm mechanisms and regulation in Staphylococcus epidermidis and Staphylococcus aureus. FEMS Microbiol Lett. 2007;270(2):179-88. doi: 10.1111/j.1574-6968.2007.00688.x. [PubMed: 17419768]. 4. Rahimi F, Katouli M, Karimi S. Biofilm production among methicillin resistant Staphylococcus aureus strains isolated from catheterized patients with urinary tract infection. Microb Pathog. 2016;98:69-76. doi: 10.1016/j.micpath.2016.06.031. [PubMed: 27374894]. 5. Fey PD, Olson ME. Current concepts in biofilm formation of Staphylococcus epidermidis. Future Microbiol. 2010;5(6):917-33. doi: 10.2217/fmb.10.56. [PubMed: 20521936]. [PubMed Central: PMC2903046]. 6. Otto M. Staphylococcus epidermidis-the ‘accidental’ pathogen. Nat Rev Microbiol. 2009;7(8):555-67. doi: 10.1038/nrmicro2182. [PubMed: 19609257]. [PubMed Central: PMC2807625]. 7. Kozitskaya S, Cho SH, Dietrich K, Marre R, Naber K, Ziebuhr W. The bacterial insertion sequence element IS256 occurs preferentially in nosocomial Staphylococcus epidermidis isolates: Association with biofilm formation and resistance to aminoglycosides. Infect Immun. 2004;72(2):1210-5. [PubMed: 14742578]. [PubMed Central: PMC321601]. 8. Wilson ML, Gaido L. Laboratory diagnosis of urinary tract infections in adult patients. Clin Infect Dis. 2004;38(8):1150-8. doi: 10.1086/383029. [PubMed: 15095222]. 9. Ikeda Y, Ohara-Nemoto Y, Kimura S, Ishibashi K, Kikuchi K. PCR-based identification of Staphylococcus epidermidis targeting gseA encoding the glutamic-acid-specific protease. Can J Microbiol. 2004;50(7):493-8. doi: 10.1139/w04-055. [PubMed: 15381974]. 10. Clinical and Laboratory Standard Institute. Performance standards for antimicrobial susceptibility testing, 24th informational supplement. Wayne, Pa; 2014. 11. Knobloch JK, Horstkotte MA, Rohde H, Mack D. Evaluation of different detection methods of biofilm formation in Staphylococcus aureus. Med Microbiol Immunol. 2002;191(2):101-6. doi: 10.1007/s00430-002-0124-3. [PubMed: 12410349]. 12. Rahimi F, Karimi S. Biofilm producing Staphylococcus epidermidis strains isolated from clinical samples in Tehran, Iran. Arch Clin Infect Dis. 2016;11(3). doi: 10.5812/archcid.33343. 13. Stepanovic S, Vukovic D, Hola V, Di Bonaventura G, Djukic S, Cirkovic I, et al. Quantification of biofilm in microtiter plates: Overview of testing conditions and practical recommendations for assessment of biofilm production by staphylococci. APMIS. 2007;115(8):891-9. doi: 10.1111/j.1600-0463.2007.apm_630.x. [PubMed: 17696944]. 14. McClure JA, Conly JM, Lau V, Elsayed S, Louie T, Hutchins W, et al. Novel multiplex PCR assay for detection of the staphylococcal virulence marker Panton-Valentine leukocidin genes and simultaneous discrimination of methicillin-susceptible from -resistant staphylococci. J Clin Microbiol. 2006;44(3):1141-4. doi: 10.1128/JCM.44.3.1141-1144.2006. [PubMed: 16517915]. [PubMed Central: PMC1393128]. 15. Petrelli D, Zampaloni C, D'Ercole S, Prenna M, Ballarini P, Ripa S, et al. Analysis of different genetic traits and their association with biofilm formation in Staphylococcus epidermidis isolates from central venous catheter infections. Eur J Clin Microbiol Infect Dis. 2006;25(12):773-81. doi: 10.1007/s10096-006-0226-8. [PubMed: 17089093]. 16. Conlon KM, Humphreys H, O'Gara JP. Inactivations of rsbU and sarA by IS256 represent novel mechanisms of biofilm phenotypic variation in Staphylococcus epidermidis. J Bacteriol. 2004;186(18):6208-19. doi: 10.1128/JB.186.18.6208-6219.2004. [PubMed: 15342591]. [PubMed Central: PMC515138]. 17. 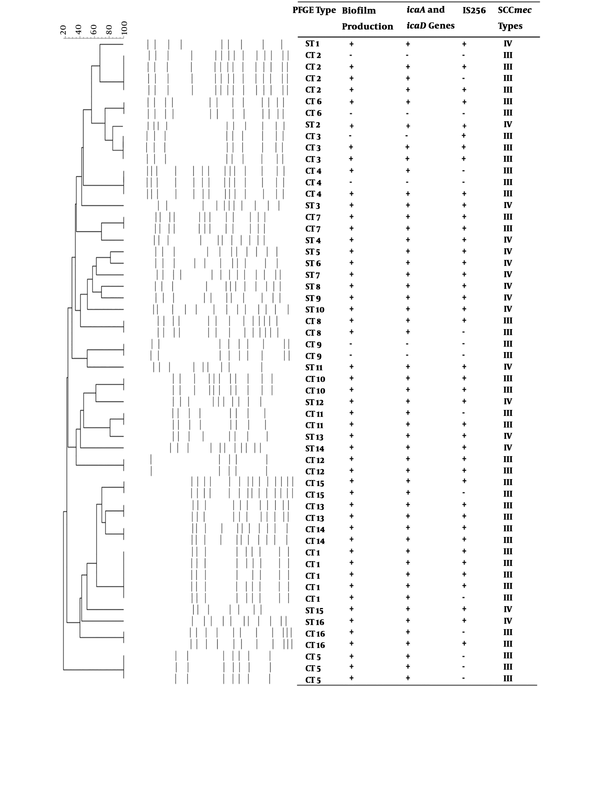 Miragaia M, Thomas JC, Couto I, Enright MC, de Lencastre H. Inferring a population structure for Staphylococcus epidermidis from multilocus sequence typing data. J Bacteriol. 2007;189(6):2540-52. doi: 10.1128/JB.01484-06. [PubMed: 17220222]. [PubMed Central: PMC1899367]. 18. Chung M, de Lencastre H, Matthews P, Tomasz A, Adamsson I, Aires de Sousa M, et al. Molecular typing of methicillin-resistant Staphylococcus aureus by pulsed-field gel electrophoresis: Comparison of results obtained in a multilaboratory effort using identical protocols and MRSA strains. Microb Drug Resist. 2000;6(3):189-98. doi: 10.1089/mdr.2000.6.189. [PubMed: 11144419]. 19. Tenover FC, Arbeit RD, Goering RV, Mickelsen PA, Murray BE, Persing DH, et al. Interpreting chromosomal DNA restriction patterns produced by pulsed-field gel electrophoresis: criteria for bacterial strain typing. J Clin Microbiol. 1995;33(9):2233-9. [PubMed: 7494007]. [PubMed Central: PMC228385]. 20. Mamishi S, Pourakbari B, Ashtiani MH, Hashemi FB. Frequency of isolation and antimicrobial susceptibility of bacteria isolated from bloodstream infections at Children's Medical Center, Tehran, Iran, 1996-2000. Int J Antimicrob Agents. 2005;26(5):373-9. doi: 10.1016/j.ijantimicag.2005.08.004. [PubMed: 16213124]. 21. Ziebuhr W, Heilmann C, Gotz F, Meyer P, Wilms K, Straube E, et al. Detection of the intercellular adhesion gene cluster (ica) and phase variation in Staphylococcus epidermidis blood culture strains and mucosal isolates. Infect Immun. 1997;65(3):890-6. [PubMed: 9038293]. [PubMed Central: PMC175065]. 22. Arciola CR, Baldassarri L, Montanaro L. Presence of icaA and icaD genes and slime production in a collection of staphylococcal strains from catheter-associated infections. J Clin Microbiol. 2001;39(6):2151-6. doi: 10.1128/JCM.39.6.2151-2156.2001. [PubMed: 11376050]. [PubMed Central: PMC88104]. 23. Arciola CR, Campoccia D, Gamberini S, Cervellati M, Donati E, Montanaro L. Detection of slime production by means of an optimised Congo red agar plate test based on a colourimetric scale in Staphylococcus epidermidis clinical isolates genotyped for ica locus. Biomaterials. 2002;23(21):4233-9. [PubMed: 12194526]. 24. de Silva GD, Kantzanou M, Justice A, Massey RC, Wilkinson AR, Day NP, et al. The ica operon and biofilm production in coagulase-negative Staphylococci associated with carriage and disease in a neonatal intensive care unit. J Clin Microbiol. 2002;40(2):382-8. [PubMed: 11825946]. [PubMed Central: PMC153361]. 25. Delgado S, Arroyo R, Jimenez E, Marin ML, del Campo R, Fernandez L, et al. Staphylococcus epidermidis strains isolated from breast milk of women suffering infectious mastitis: potential virulence traits and resistance to antibiotics. BMC Microbiol. 2009;9:82. doi: 10.1186/1471-2180-9-82. [PubMed: 19422689]. [PubMed Central: PMC2685400]. 26. Gad GF, El-Feky MA, El-Rehewy MS, Hassan MA, Abolella H, El-Baky RM. Detection of icaA, icaD genes and biofilm production by Staphylococcus aureus and Staphylococcus epidermidis isolated from urinary tract catheterized patients. J Infect Dev Ctries. 2009;3(5):342-51. [PubMed: 19759503]. 27. Mack D, Rohde H, Dobinsky S, Riedewald J, Nedelmann M, Knobloch JK, et al. Identification of three essential regulatory gene loci governing expression of Staphylococcus epidermidis polysaccharide intercellular adhesin and biofilm formation. Infect Immun. 2000;68(7):3799-807. [PubMed: 10858187]. [PubMed Central: PMC101651]. 28. Vandecasteele SJ, Peetermans WE, R Merckx R, Rijnders BJ, Van Eldere J. Reliability of the ica, aap and atlE genes in the discrimination between invasive, colonizing and contaminant Staphylococcus epidermidis isolates in the diagnosis of catheter-related infections. Clin Microbiol Infect. 2003;9(2):114-9. [PubMed: 12588331]. 29. Koskela A, Nilsdotter-Augustinsson A, Persson L, Soderquist B. Prevalence of the ica operon and insertion sequence IS256 among Staphylococcus epidermidis prosthetic joint infection isolates. Eur J Clin Microbiol Infect Dis. 2009;28(6):655-60. doi: 10.1007/s10096-008-0664-6. [PubMed: 19034541]. 30. Li M, Wang X, Gao Q, Lu Y. Molecular characterization of Staphylococcus epidermidis strains isolated from a teaching hospital in Shanghai, China. J Med Microbiol. 2009;58(Pt 4):456-61. doi: 10.1099/jmm.0.007567-0. [PubMed: 19273641]. 31. Johansson A, Koskiniemi S, Gottfridsson P, Wistrom J, Monsen T. Multiple-locus variable-number tandem repeat analysis for typing of Staphylococcus epidermidis. J Clin Microbiol. 2006;44(1):260-5. doi: 10.1128/JCM.44.1.260-265.2006. [PubMed: 16390986]. [PubMed Central: PMC1351942]. 32. Spare MK, Tebbs SE, Lang S, Lambert PA, Worthington T, Lipkin GW, et al. Genotypic and phenotypic properties of coagulase-negative staphylococci causing dialysis catheter-related sepsis. J Hosp Infect. 2003;54(4):272-8. [PubMed: 12919757]. 33. Chaieb K, Abbassi MS, Touati A, Hassen AB, Mahdouani K, Bakhrouf A. Molecular characterization of Staphylococcus epidermidis isolated from biomaterials in a dialysis service. Annals of microbiology. 2005;55(4):307. 34. Chaieb K, Touati A, Salah AM, Hassen AB, Mahdouani K, Bakhrouf A. DNA fingerprinting of a multi-resistant coagulase-negative staphylococci isolated from biomaterials in dialysis services. Arch Med Res. 2006;37(8):953-60. doi: 10.1016/j.arcmed.2006.06.007. [PubMed: 17045110]. 35. de Mattos EM, Teixeira LA, Alves VM, Rezenda e Resende CA, da Silva Coimbra MV, da Silva-Carvalho MC, et al. Isolation of methicillin-resistant coagulase-negative staphylococci from patients undergoing continuous ambulatory peritoneal dialysis (CAPD) and comparison of different molecular techniques for discriminating isolates of Staphylococcus epidermidis. Diagn Microbiol Infect Dis. 2003;45(1):13-22. [PubMed: 12573546]. 36. Miragaia M, Carrico JA, Thomas JC, Couto I, Enright MC, de Lencastre H. Comparison of molecular typing methods for characterization of Staphylococcus epidermidis: Proposal for clone definition. J Clin Microbiol. 2008;46(1):118-29. doi: 10.1128/JCM.01685-07. [PubMed: 17989196]. [PubMed Central: PMC2224289].